The Priests of Rathma—or necromancers, as outsiders call them—have long remained shrouded in mystery. Deep within the jungles of Kehjistan, they train to preserve the delicate balance between the forces of life and death. Now Sanctuary has need of their unique power, and the Priests of Rathma will answer. You’re bound to have questions about this upcoming addition to Diablo III: Reaper of Souls. While some details are still coming together, consider this your one-stop shop for the initial lowdown on the master of the dead! Q: What is the Necromancer? 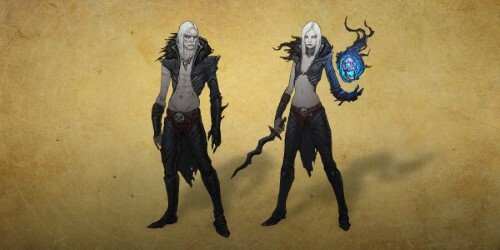 A: The Necromancer will be the next fully-playable class introduced to Diablo III: Reaper of Souls. As a master of the dark arts, you draw your magic from the power of death itself, and command mighty armies of risen warriors! Oh, and you can make corpses explode. There are definitely exploding corpses. Q: Who will be able to play the Necromancer? A: We’re still settling on final details, but the Necromancer will be available as part of the Rise of the Necromancer pack, set to release in 2017. Players will need both Diablo III and Reaper of Souls to access this content (or, in the case of console, the Ultimate Evil Edition on PlayStation 4 or Xbox One). Q: What will we get as part of the Rise of the Necromancer pack? A: In addition to unlocking the Necromancer as a playable character, players will also receive an in-game pet, two additional character slots, two additional stash tabs (on PC), a portrait frame, pennant, banner, and banner sigil. Q: When will the Necromancer be available for purchase/in-game? A: Sometime in 2017—we’ll provide more details as we near release! Q: How much will the pack cost? A: We’re not ready to announce a price just yet. Stay tuned! Q: Will the Necromancer be coming to all regions? A: The Necromancer will be available in all regions that currently support Diablo III: Reaper of Souls or Diablo III: Ultimate Evil Edition. Details on accessing the new hero will be available at a later date. Q: Is this the same Necromancer from Diablo II or Xul from Heroes of the Storm? A: No. The Necromancer playable characters will be two new nephalem heroes: one male, one female. Q: Where is the female Necromancer? A: The Necromancer is still in very early development. We’re hard at work on the class as a whole, and the female model just isn’t ready for us to share with you yet! Here’s some awesome concept art, though. Q: How is the Necromancer different from the Witch Doctor? A: The Necromancer and Witch Doctor are quite different in both theme and play style! Witch Doctors draw their magic from their spiritual connection to a realm they call the Unformed Land. This more light-hearted take on supernatural powers allows them to command creepy crawly denizens of the jungle and summon mindless zombified pets. Necromancers can expect darker, more controlled gameplay centered around the raw materials of life: blood and bone. Grounded in a philosophical, pragmatic approach to life and death, they’re more like a calculated conductor of the darkest arts. Deadly serious in their practice, they are the experts of curses and reanimation—and their pets obey their every command. Q: What sort of skills or abilities can we expect from the Necromancer? A: The Diablo III Necromancer is a reimagining of the classic Diablo II class. While not all of the Diablo II class skills will be returning, we drew a lot of inspiration from the previous version of the Necromancer and have taken the Diablo III version in a direction we hope you’ll love! Q: Will the Necromancer get set items and class-specific legendaries? A: Yes! We are planning a full set of legendaries and set items for the Necromancer, including the class-specific scythe in their main hand. Additional details will follow at a later date! The Necromancer will be coming to Diablo III in 2017 and we’re eager to share more details with you as they become available. What are you looking forward to the most with the Necromancer? Are there any skills or nostalgic weapons you’d like to see our newest nephalem wield? Let us know in the comments section, and stay tuned for more information as development continues!